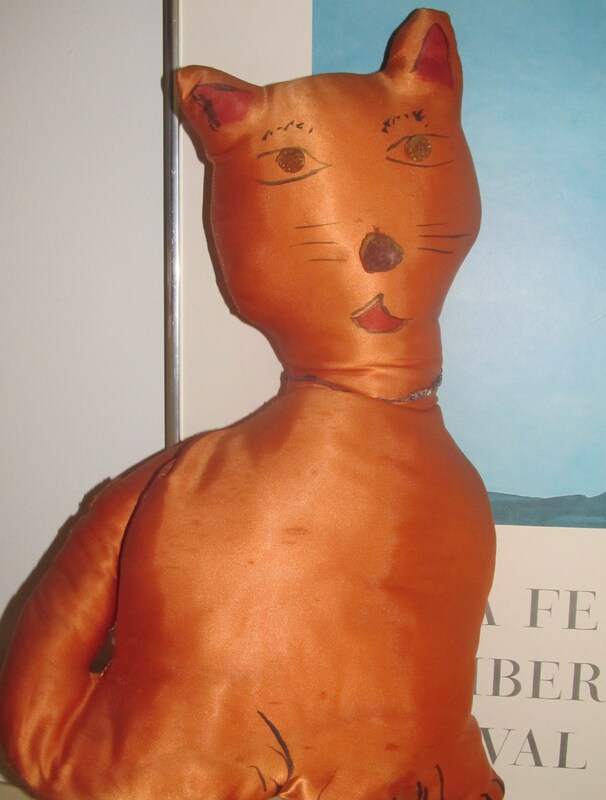 The orange, hand-painted silk cat was a gift from my sister, way back in grade school. It now occupies a shelf in one of my twins rooms. 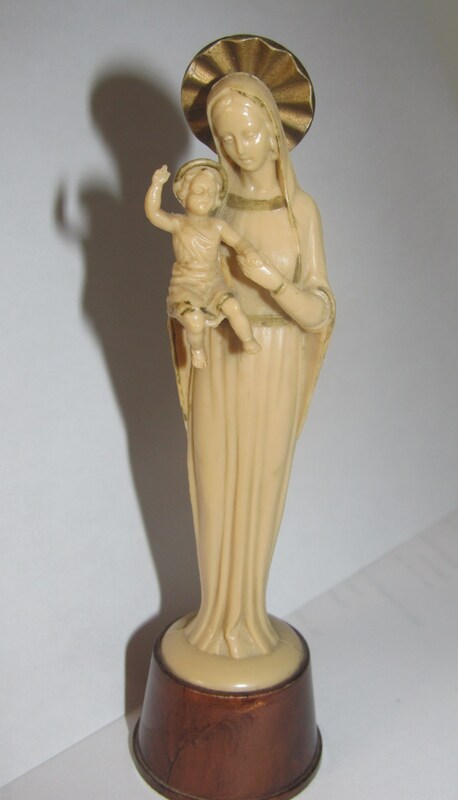 The plastic Virgin Mary with child was bought at a flea market when I first moved to NY. The elderly lady who sold it to me assured me that she had owned it since she was a little girl and it had traveled with her from Italy to the USA. At first glance, the Writing Challenge topic enthralled me. Who wouldn’t want to share the various knick knacks that have journeyed with them through life’s roller coaster? I looked around and was quite surprised that nothing in particular stood out. Don’t get me wrong, I have beautiful things but nothing stood out. Why not? Well, certain things hold great value for us but the true treasures are beyond our things; they are the memories and people connected to those things. You see, as a child, I traveled and moved quite a bit so that my favorite things, my special knick knacks or heirlooms were, instead, memories held close to my heart and people, family and cherished friends, held even closer. We moved for good and bad reasons; my dad’s promotions and the civil war. Each move left me with lifelong lessons that persist today… More below! 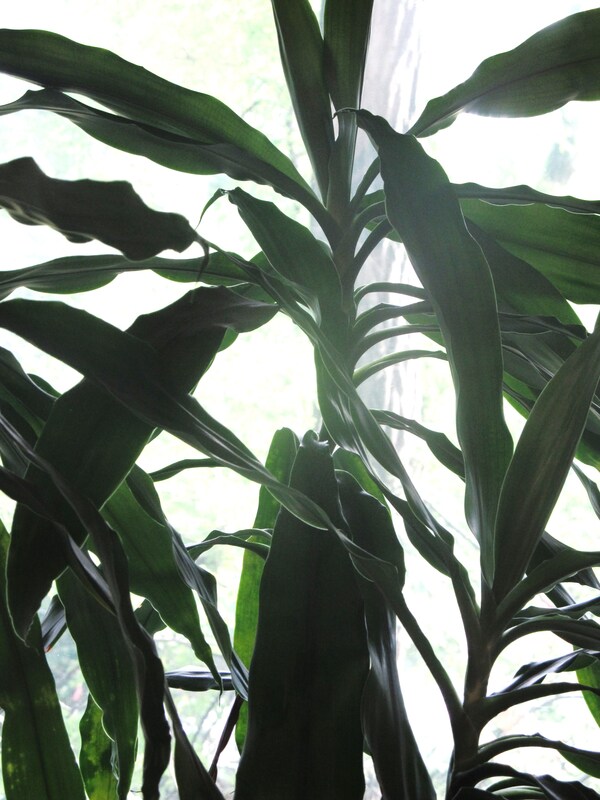 This indoor plant has followed me everywhere in the US. It is now the size of a small tree. These are the indelible, lifelong lessons that I hold dear today: Cherish the good, celebrate and enjoy the abundance, travel the world, capture each happy moment in a friendship for the next move might mean we lose touch. Save items for days of shortages, become acutely aware of the brevity of life, and head for the hills when the enemy arrives. Yes, they were conflicting messages and left little room for choosing things as favorites. I looked around my home anyway and found a few things with a bit of longevity and personal history… After all, the little things matter. I hope you enjoyed this post. What about you and your favorite things? Have a spectacular weekend ahead! You are already a light on the path. What are your thoughts? Do you have one or several favorite things? Where did those things come from? What memories do they hold for you? What insights could you share with others? Do share! Thank you. Positive Motivation Tip: We walk our path in life to learn important lessons and connect with others… Cherish the love and the lessons. I love your statute, virgin Mary… Such a wonderful possession to share with all of us. I’m impressed that it’s not the most valuable or expensive that you’ve chosen to showcase, but the most precious…in terms of the sentimental connections. In other words, the true treasures..
My mom has a similar status of the Virgin Mary. She brought it from Italy 60 years ago. It stands in her bedroom window now. It evokes memories of when I was much younger, afraid to enter her room in the evening because the statue glowed in the dark. Now I look at it and it warms my heart. This is certainly an interesting topic and one that makes you stop and think about possessions we ahve gathered over the years. Or could it also be things I like like the sun setting on the ocean? My favorite things include posts like these, which remind me to be both cognizant of and thankful for my (other) favorite things. Most of all among these are the people in my life, past and present. I really liked the first quote also the last motivation Tip both Gems. Favorite things I know one is a necklace my father gave me with a tanzinite stone. It was very sweet and has sentementel value. Also a blue tea pot called a blue betty. A pretty colbolt blue teapot a coworker gave me, because I was drinking tea all the time at work. It is the simple things and the memories of people. Little things can add up to big things – a nice “bouquet of moments” as I like to use. It’s not my phrase, someone said it to me a while back, but I use it frequently. Wonderful touching post! So much caring to loved ones! I really enjoyed your honesty here when you went searching for meaningful things you own. It is not really the items themselves but the memories summoned as a response to the item. “true treasures are beyond our things; they are the memories and people connected to those things” – I so agree! Great post Eliz! Beautiful post Eliz. Yes, our most cherished possessions are never the most valuable. I have a friend whose family lost everything in a fire and the only thing they have to cherish is not any material possessions but what they kept stored in their hearts. It reminded me, as your post, that every moment we live is precious and should never be taken for granted. Thanks, E.! Things can never replace the memories we have in our lives whether good or bad. They are what make us whole. Nice post …!!! The cat is adorable.